— You, 1 year ago. — You, looking at your code from 1 year ago. 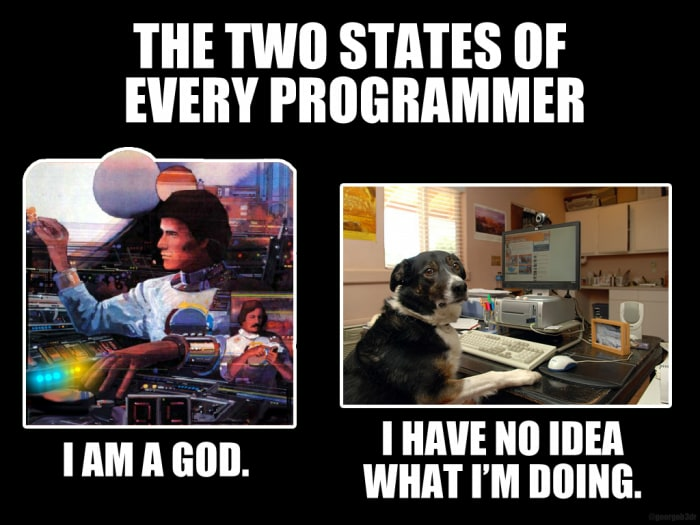 And anyone else that may work on the code that you've written. Did this article relate to your experiences? Do you have any other suggestions for readable code? I am constantly looking to improve myself, so please feel free to tweet me or drop a comment below. I would say, don't be afraid to leave a comment. Last week I came across some old code I wrote that I didn't think was needed. I yanked it out and was ready to issue a PR but luckily a spec caught an instance where we needed it. I added the code back and put a little comment to where the code was (not in an obvious way)referenced. If I had done that from the start I could have saved my current self a little bit of time and hassle. That's a perfect use case for a comment! I prefer code that is self descriptive but sometimes a comment is needed to explain why some code exists or was written a certain way. I would rather put that in the documentation of that function/method/class/whatever. I do not use comments in my code be it Python, Haskell, Java because I think that comments lie to you most of the time (I am a little biased towards this position after reading "Clean Code" from Robert Martin). I am a junior developer. I agree in the principals of clean code and this is a great use case for a comment. With regards to moving it into documentation, I'd prefer to have a single source of information. It's easier to update a comment (yes, I'm aware they can become outdated) than documentation which has the same issue of becoming out dated. and skip all the constants. // Does the user have any posts? I guess I could name that boolean instead of writing the comment (or doing nothing at all) but I'm just being honest, and this best represents what I usually write at this time in my life. And indeed, naming is hard (I didn't find your name descriptive enough). Not sure which is better. Comments go stale easier than names, but this pollutes the scope. Maybe I should wrap the const+if into a block for lexical scoping. That would be wild. Ha. Ha-ha. Ha. I see no issues with reading your code, plus what I provided in the article are only meant to serve as suggestions. My own examples could definitely be improved as you showed. I do prefer adding a variable over a comment though, because as you said: comments become stale. They are easier to update though, since once someone finally realizes what that damn thing represents, they can apply a "rename identifier everywhere" refactoring tool. Haha, yeah good point. I agree that they are easier to update. I like to use comments as a last resort to explain why a piece of code is written in a certain way or exists in the first place. I would enlighten myself using function that returns a boolean keyword should followed by a camelCase in naming convention. I would like to thank Dart's linting that separates class, functions,private and public variables and collections(known for arrays in some languages). Leave comments explaing "why" feature. I watched John Papa's video about "Writing Readable Code" and how it helped me learned cleaner and concise code. Great post! I had the same experience as you did. Thanks! It's great when languages have built-in constructs that help with writing more readable code. Definitely agree on having comments that explain "why". I'll take a look at that video, thanks for sharing Vince! You're right, good catch! Maybe I should write unit tests for my article code blocks haha. And like in my other comment, I would suggest the early return pattern that has been refactored out of validateUsername be reintroduced. I LOVE the separate your conditions bit here. I never thought about doing that before but I'm gonna start doing this in all of my code. Super happy to hear this! Glad you were able to grab something actionable. I would challenge the idea that single responsibility means can't do more than one thing. Several have shown the challenge of refactoring into this approach. The db access I would argue isn't related to username validation. I mean if it isn't valid how does someone have it. Great points about the naming! I find it easier to make improvements later when I can see not only what I did ages ago, but how I did it just as easily. Thanks Marissa! Exactly, being able to understand how your code is functioning definitely helps with future changes. It looks like our experiences are very similar. Making a function do one thing, making meaningful variable/function names. Simplicity is key for readability, I get really confused and I tend to have trouble understanding what's going on if the code is written poorly. Either from my past self or modifying a website that was built by someone else or a framework's code. Hi Nick! I'm happy to hear that. You've covered the key points of the article. I guess off-by-one errors are in the past since everyone switched to iterators/functional methods? Haha I was debating on including that but I don't think that's the original quote. Didn't seem relevant anyway. Well I have two comments on this post where I go on about how hard naming is, so the rest was definitely to the point. Yep, I definitely agree in cases where the optimized version is just as readable. Which would only run checkUsernameExists if the tests before it pass. But it's somewhat pseudo code anyway. The point of db.query was to show the single responsibility. The fundamentals, well explained with examples 👌 Thank you ! !